At the center of the interests of the Steinmetz Foundation are the youngest, especially those living in a "culture of poverty". With various support programs for schools in the most disadvantaged areas of large cities, the foundation proposes an education based on experience, a form of "literacy" that goes beyond the "alphabet", i.e. that aims to help "reading" the reality. This is why our commitment to include the little ones in the great adventure of a participatory archeology is a project we live together with the Steinmetz Foundation. 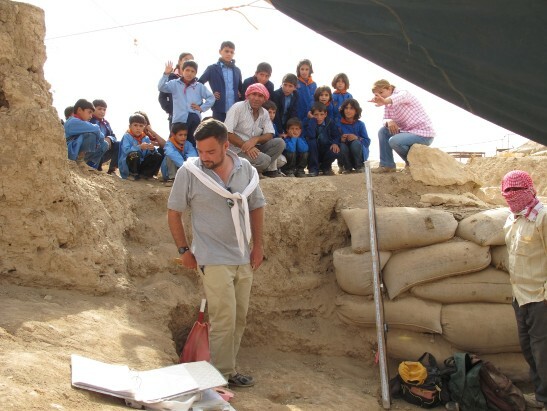 The two photos on the side illustrate two moments of our work in the past years: those of the excavation period, and the ones in which we began to "recount" the excavation, being unable to implement it on the ground. Our new major commitment is now to involve two middle school classes, one located close to the excavation and the other one in Italy. The financial and moral support of the Steinmetz Foundation will help us to achieve it. We fight against two "cultures of poverty". The first one is the extreme poverty brought by the war, in Syria, a war that also saw an ideological violence that wanted to destroy the identity based on the material culture of the past. This is what the Syrian kids who participate in our project will talk about. The second poverty is that most hidden, but not less serious, of the cultural inertia of young people in Italy, so addicted to well-being and so immersed in technology that they run the risk of developing a pervasive passiveness toward the riches of their past. The exchange between these two groups of young people will teach a lot not only to them, but, certainly, to us too.